So I've actually never done a favorites post, so here are some of my favorite things to wear on both my face and my body this month! Disclaimer: ALL of these favorites are reviews and thoughts of my own, no one told me what to say and I paid for these items. I should really call this a Target Haul because I love that store. haha! 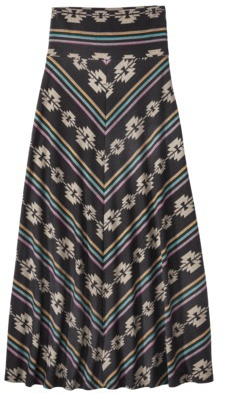 So one thing I've been absolutely loving this summer is a comfortable maxi skirt. I've added two to my wardrobe this summer and I seriously find myself reaching for at least one of them once a week. They are long and have cute but appropriate patterns so I wear them to work a lot. My office is a bit more casual than most, but the building itself has at least a base dress code. I wear them with a tank top and an easy flowy cardigan/cover-up and I'm so comfortable all day. The ones I have were from Target and cost $17.99. I own them in both Black Tie and Typhoon Gray Opaque. Continuing the maxi trend, I've also been loving another maxi dress and have been trying to work the all white summer trend by wearing this dress from Target. I wore it for the fourth of July with my family. Now I usually don't go for strapless things because my ladies are a bit large and strapless bras just never do a good job, but I saw this dress and just had to have it. I did however buy it on sale in store, but it is online for $30. I wear it for nice summer occasions and always seem to pair it with simple easy gold accessories. This is the makeup bag I carry in my purse. Lips: I have been loving the Nyx Butter Glosses in both Sugar Cookie and Raspberry Tart (not pictured above because they are buried in the bottom of my purse, whoops!). But when I don't want super glossy lips I've been using the Jordana Twist & Shine Moisturizing Balm Stain in Candied Coral and Tropical Frenzy (shown above). I also own it in Rock N Rouge, and my Mom has been lovin' it in Cranberry Crush. It keeps its color all day and was available at the local drugstore for a steal at $2.99. 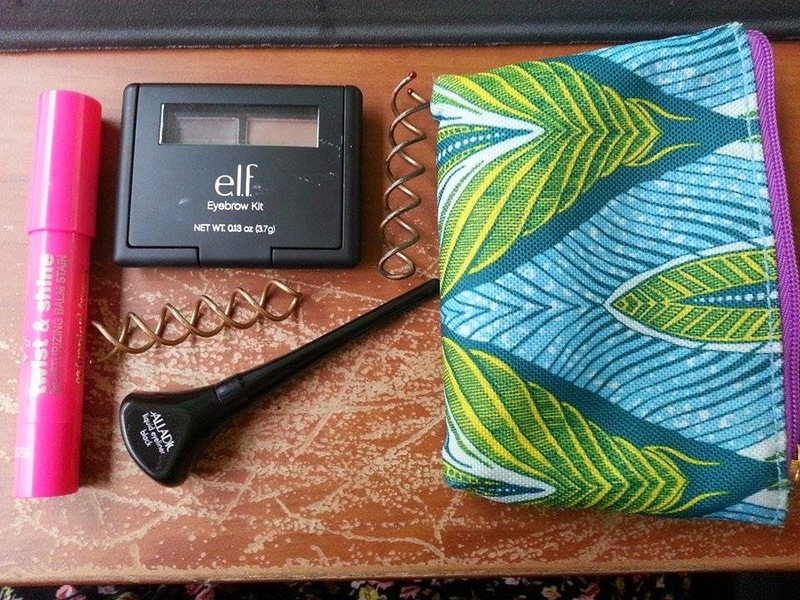 Brows & Eyes: I picked up the elf eyebrow kit at Target one weekend and have been using it religiously since then. It takes a bit of getting used too, but its well worth it & it darkens my eyebrows wonderfully. The liquid liner pictured above is the Palladio liquid liner in Black. Its just a standard liquid liner I picked up at Sallys & I like it, its actually almost empty. Hair: Also pictured is the Spin Pins. Ladies (or fellas) if you've got long hair and can't find a hair-tie these bad boys will do the trick. I've been opting for these instead of a traditional hair-tie. And the best part is when you take them out you have beautiful beachy waves (with no crease!). 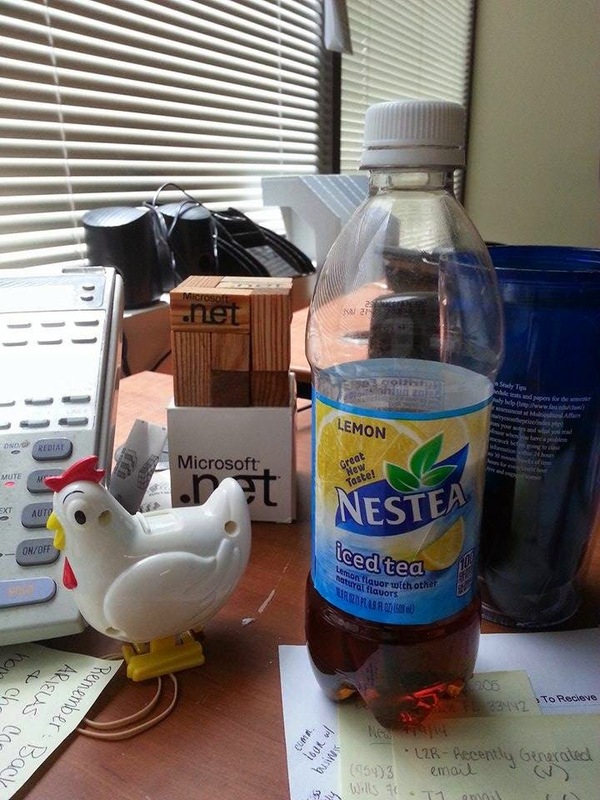 Nestea iced tea with lemon flavor - why? I don't know, probably because its the only thing I've been drinking other than water. 100 calories a bottle, and I always seem to have one sitting on my desk. Raspberries - I don't know where Publix has been getting its raspberries from, but oh lordy have they been scrumptious! I'll eat 1/2 cup as a snack during the workday.